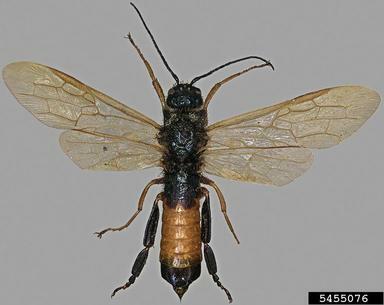 The Sirex woodwasp (Sirex noctilio) is a pest of pine trees. Mature females lay eggs, fungi, and toxic mucus under the bark of a host tree, which often causes tree death. Surveys are conducted because of the presence of potential host material in Wyoming, the non-port appearances of this pest around the country, and potential for significant harm to pine. It has been found in the US. To date, it has not been found in Wyoming. The Sirex woodwasp Survey is conducted by the Animal and Plant Health Inspection Service, Plant Protection and Quarantine. A Lindgren funnel trap with host attractant is placed on or near the host plant from May until September. If suspects are found they are sent to a state entomologist for further identification.